This is a small porcelain lid of a toothpaste pot which was manufactured sometime around the mid 1880s or early 1890s by John Gosnell & Co of London. 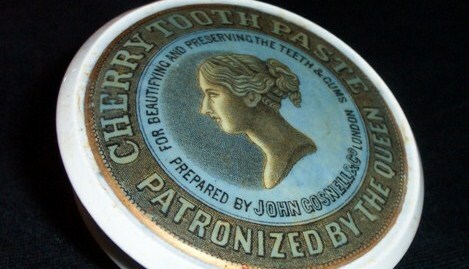 It was a popular brand of toothpaste until the First World War, and the company still exists today. The lid itself is ornate, with gold accents and a neo-classical bust of Queen Victoria – but thousands of such pots must have been manufactured and shipped to parts of what was then the British Empire. The cherry toothpaste and the lower half of the container have been used and discarded, but this lid helps us in part to understand how settlers established their lives in a new land. This particular pot-lid was found on the site of the Kihikihi Redoubt by Richard Paul in the late 1970s and was later donated to the museum. The Kihikihi Redoubt was built during the Waikato Wars of the 1860s to strategically guard an important road into and out of the King Country. It was occupied by Imperial troops until the late 1860s when the Armed Constabulary took over. After an official peace was made with iwi in the early 1880s the site was used by thy Police Department where they had a residence and a lock-up for a number of years. In 1984 an archaeological survey of the site commissioned by the Historic Places Trust unearthed a number of other objects. The report also concluded that the site had a very different use for a number of years as a strawberry patch.